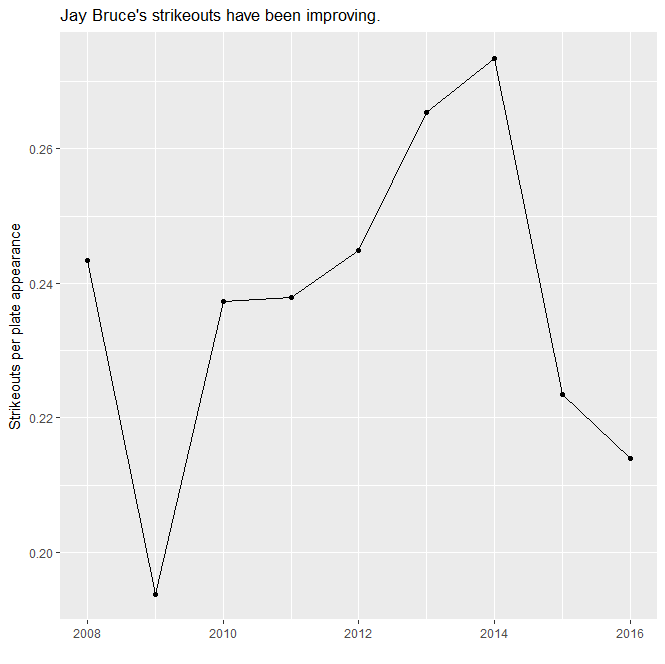 In an earlier post, I noted that Jay Bruce would have been expected to accumulate about .0838 walks per plate appearance (whether that’s estimated using a linear time trend or a quadratic one). It’s interesting to note that Bruce hasn’t merely hit more home runs and taken more walks so far, he’s also struck out significantly less. 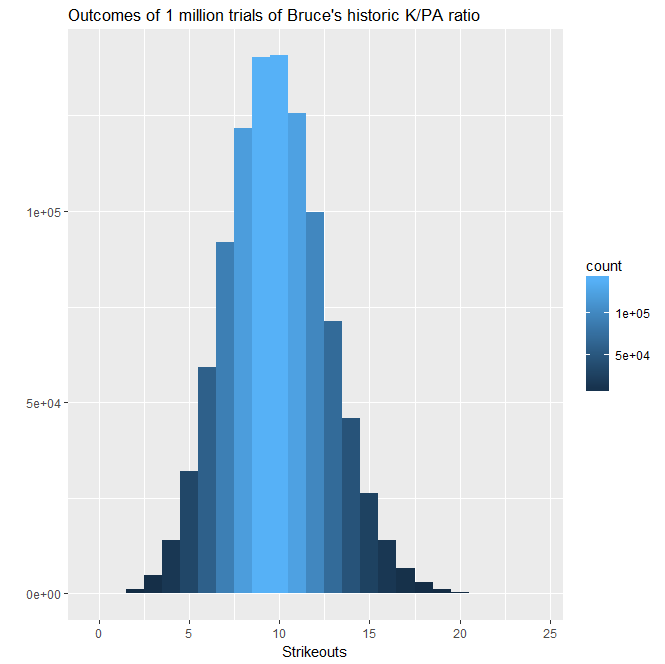 Using R, I simulated 1,000,000 46-plate-appearance streaks, using a binomial trial system (simulating only “struck out” or “didn’t strike out” as outcomes). Choosing what rate to use for Bruce’s expected rate of strikeouts per plate appearance (K/PA) was a challenge. Last season, he had a historically low K/PA rate of .2139 (one strikeout ever 4 2/3 plate appearances) – bested only by his 2009 season (.1938). His rate with just the Reds was .2065 and his rate with just the Mets was .2299. Estimating a time trend was difficult because Bruce has fluctuated quite a bit, yielding .2429 for a linear model and .207 for a quadratic model. His total strikeouts through the end of 2016 (1239) divided by his total plate appearances (5189) give a rate of .2388. A simple average of his yearly K/PA numbers gives .237. Those 1,000,000 streaks of Bruce’s 46 plate appearances yielded a distribution clustered around 9 and 10 strikeouts. The mean was 9.841 and the median was 10. About 28% of the distribution was contained in the 9- and 10-strikeout blocks. As for his actual number, Bruce has only struck out 4 times. The likelihood he’d have 4 or fewer strikeouts at this point is only about .02, meaning it happened about 2% of the time. That figure would be even smaller if we assumed a higher rate of strikeouts. When strikeouts decrease at the same time walks increase, there are a few possibilities. It could be that the small sample size is emphasizing Bruce facing worse pitchers than usual, or umpires who are more batter-friendly than usual. Ruling out those possibilities would simply require examining how the rest of the Mets are faring compared with previous years. It’s also possible Bruce is simply on a hot streak and will cool down to his expected levels soon. Nevertheless, he’s been batting smart this year, including finally bunting through a shift last night in a crucial play to come back from an early deficit.